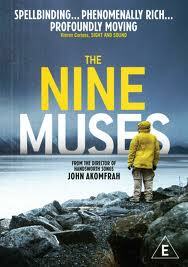 It will take more than one viewing to do justice to John Akomfrah’s The Nine Muses, time to mull over the images, the words, the sounds. But some preliminary thoughts are in order. I first heard about this film when it featured in Sheffield’s DocFest programme last year, but didn’t manage to see it, and have been looking out for it ever since. So much about that brief blurb rang bells for me. John Akomfrah himself is a Ghanaian, born in 1957, so the same age as Ghana (and as me). The theme, migration, is one that fascinates me, and in particular the response of my home country to the people who’ve arrived on its doorstep from all over the world, those who’ve been invited, those who’ve come here in hope, those who’ve come here in desperation. And I love the idea of exploring this through words, sounds and images drawn from sources as diverse as those people. it suggests that stories normally seen through the lens of postcolonialism could just as easily be seen in existential or mythic terms. In doing so, it invites viewers to reflect on the labels by which history – especially diasporic history – is framed and categorised.”It’s important to read images in the archive for their ambiguity and open-endedness,” Akomfrah argues. I am obsessed with archival material: those ghostly traces of lived moments, those pariah images and sounds that now occupy a unique space somewhere between history and myth… How does one begin to say something new about a story everyone claims to know? … what considerations should govern how one constructs a “historical fiction” about events and lives that have been profoundly shaped by what the St Lucian poet Derek Walcott called, “the absence of ruins”? Lives without monuments, without the ‘official’ signature of recognition and interest. This film is my attempt to suggest what some of those “ruins” might look like, a desire to look into that dark mirror of one’s own past in search of images, ideas, writers and music with which to construct such a monument. I thought often whilst watching the shots from the 60s of an earlier migrant, Horace Buck, from Michel Butor’s Passing Time. 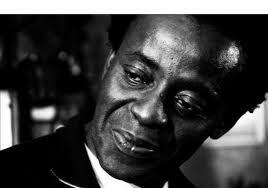 Horace is an African in Bleston (Manchester) in the early 50s, isolated from what would seem to be his fellows because they are mostly from Sierra Leone, and he is not (we do not find out where, his story starts as he arrives in England, just as that of his French counterpart does). Horace and Jacques are drawn together because both are isolated exiles, and Horace’s bitter, sardonic, smoky laugh punctuates the narrative, as he introduces Jacques to the bars and arcades that he frequents, where his money is welcome but he is not. He is a generous man, insistent on offering Jacques his hospitality, and even securing lodgings for him, but his generosity and dignity are constantly met with rebuffs. The landlady he finds for Jacques can’t know that he was involved as she regards all of his kind as ‘black devils’. Jacques’ friends are at best uneasy and at worst openly horrified at their association. Horace finds solace in the arms of a succession of English girls and in the music of his harmonica, and, possibly, revenge in minor acts of arson. There’s no polemic here, no overt social commentary (less so than in Butor’s later work on the USA, Mobile, where he uses the texts of treaties with the Native Americans, amongst other found sources, or in his collaboration with composer Henri Pousseur, which uses protest songs). Here too, as in Akomfrah’s film, the story of this exile trudging the streets of a dismal city, is intercut with mythic narratives, of Theseus and the Minotaur, of Cain and his brother, of Oedipus and his father. So many of Akomfrah’s images are in my mind now. The empty icy landscapes and the faces, hopeful, anxious, resigned. The voices too – patrician tones reciting Shakespeare – ‘this sceptred isle’ – Leontyne Price and Paul Robeson, a West Indian migrant speaking of the gulf between the paradise he hoped for and the reality he encountered. Polyphony.